Recently, teachers had a great time at the Museum participating in fun fashion projects during our ExxonMobil Teacher Training called High Fashion. Try out this activity from the class. Have fun and be careful! 1. Grab an adult to help you. You must have supervision for this project! 2. What is batik? Batik (pronounced ‘Bah-Teak’) is a technique used to dye fabrics. Wax is applied to the areas on a piece of fabric that are not to be dyed. There are various ways that this is accomplished, but the most common are for the hot wax to be “painted” onto the fabric using a brush or to be poured onto the fabric directly. Once the wax hardens, it has penetrated the fabric and it is now time to dye the fabric. The hard wax prevents the dye from penetrating the fabric in the areas it has been applied. The wax is removed after the dyeing process by using a solvent or heat. 3. Pick a fabric that you would like to dye. Thin cottons work well (not t-shirt cotton). You can buy remnants cheaply at a fabric store. You will need to make sure and wash the fabric before the activity for the dye to penetrate properly. 4. Melt the wax in a soap kettle or in the microwave. Please be careful, as hot wax can cause serious burns. 5. Mix the cold water dye according to package directions. Be careful not to get this on your clothing as it will NOT come out. Put the dye aside for now. 6. Sketch out your design on a piece of scratch paper. Make sure to keep in mind the size of your fabric and plan accordingly. 7. Put down some old newspaper to work on. Dip a q-tip into the wax and use it to draw the design on your bag. 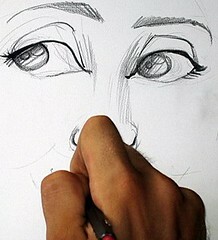 You could also use a fine-tipped paint brush to apply your design. Allow the wax to dry. This takes very little time. 8. Put on disposable gloves and immerse the fabric into the dye. Be careful not to get it on your clothes, as it will stain permanently! 9. Remove the fabric from the dye and allow it to dry. 10. Using an iron, remove the wax by pressing the fabric between two pieces of heavy brown paper. Grocery bags work well for this. 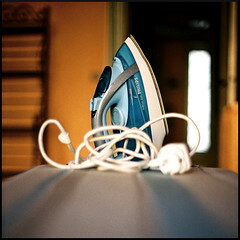 It is best to use an old iron or extra paper to protect your iron from the wax. 11. Look! You have a beautiful fabric design! 12. Do not wash your fabric with other clothing as some of the dye may come off in the wash. Previous Post Thank you, onliners!